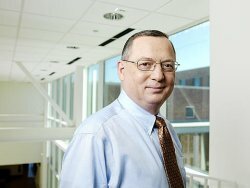 Congratulations to Dr. Bill Weber of Pacific Northwest National Laboratory on being selected for the Distinguished Alumni Award, the highest University of Wisconsin Oshkosh alumni honor given. Weber and eight others will be honored for their professional and civic achievements during homecoming weekend, October 16-17, 2009. Weber is an internationally recognized expert in defects and radiation effects in materials. His research, often done at the Department of Energy's EMSL, is essential for advanced electronic devices that operate in extreme conditions, developing radiation-tolerant materials for nuclear power, as well as for space exploration and research. He received his bachelor's degree in physics from University of Wisconsin Oshkosh. While there, he was part of educational programs that allowed him to work and study at Oak Ridge National Laboratory and Argonne National Laboratory. With this experience, he went on to get a master's degree and doctorate in nuclear engineering from University of Wisconsin Madison. An active member of the scientific community, he is a Fellow in the American Association for the Advancement of Science, American Ceramic Society, and the Materials Research Society. He is a prolific author, having written or co-written more than 420 peer-reviewed publications and 51 technical reports. He is also an outstanding editor, currently serving as a principal editor for the Journal of Materials Research.